I would like to invite you to join me for the first "Coffee with the Principal" next Friday, November 2nd. This informal meet and greet event will be a time for me to chat with families to gain more insight into your hopes for this school year and beyond. Parent feedback is very valuable to me as a leader and helps us grow as a school. We'll be meeting at the picnic tables on the playground from 8:40-9:15 and drinking coffee provided by our amazing PTA. I hope to see you there! You can still register in advance by submitting a registration form and cash (exact change please) or check to the front office by Friday, Oct 26th. Day of event registration for the Fun Run will be $5 dollars more so save by registering ahead. Meal tickets and wristbands can be purchased at event (see registration booth). If you registered by Tuesday, October 23 your student will receive their t-shirt in time to wear to school tomorrow (10/26) for a Fun Run spirit day! We need parent volunteers for the carnival and at the grill for lunch! Click HERE to help. Avid4Adventure will have a rock climbing wall at the carnival. They require a waiver to be signed. Click HERE to complete the waiver ahead of time. We will have a pumpkin carving contest at the carnival so bring your pre-carved/decorated pumpkin. We will pick the scariest, funnies and most creative. Kids are also welcome to come in costumes. No time to cook? Running fast between soccer, lacrosse and dance? Join us for the next Restaurant Giveback night at Potbelly on Thursday, November 1st! Potbelly is committed to supporting the UPark neighborhood so is generously donating 25% of all purchases between the hours of 5-8pm. Just mention UPark (and tell your friends) and you'll be dining with a purpose! Pearl Wine Company is giving 100% of the ticket sale proceeds for their upcoming 3rd Anniversary Wine Tasting event on November 3rd to neighborhood schools, including UPark. Attendees will have the opportunity to taste over 150 wines and receive event only discounts on orders (just in time to order wine for Thanksgiving and Holiday parties). 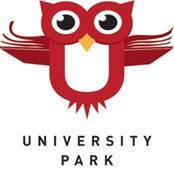 Tickets can be purchased from the UPark PTA for $40 via cash or check made out to "UPark PTA," or online HERE (a small online transaction fee applies). Email vp@uparkelementary.org to purchase a ticket with cash or check, or talk to PTA VP Angela Rathbun on the playground at pickup or drop off. We are looking for Book Fair volunteers to do everything from help set up displays and prep the library for the fair to working at the fair helping kids choose and buy books. Please click HERE to sign up and select a time and task you would like to volunteer for. University Park welcomes students and families to celebrate the Thanksgiving holiday with a turkey lunch in the school cafeteria on Wednesday, November 14th. The lunch will be held at your student's regularly scheduled lunch time. Guests, please visit the school cafeteria to purchase your meal tickets no later than Wednesday, November 7th. Cafeteria staff will be available each morning until 11:00am. Current UPark students will purchase a meal using their student ID at the same price as a regular cafeteria meal. Contact the main office at 720-424-3410 with questions. Click here to view the Thanksgiving lunch menu. Please contact Kyle Wiley for any Discovery Link or Enrichment absences during this time at (720) 467-1671 or kyle_wiley@dpsk12.org. E-mail communication works best. For immediate assistance with other questions about Discovery Link - contact Jesse Broadfoot at jesse_broadfoot@dpsk12.org.